This repository includes the collections of the library, the collections of the Holly Monastery of Saint Prodromos and the collection of the Greek Lyceum – Veria’s branch. Presentation of the Digital Libraries of the University of Macedonia Information Center in Dspace User Group Meeting (DSUG2006), Burgen, Norway (2006). Source code and instructions in order to enable Europeana Semantic Elements support in dspace 1.5.2. Last update: 2012-05-01. The problem is that if we want to share our metadata with Europeana, we have an incompatibility because Europeana does not support Dublin Core but Europeana Semantic Elements (ESE), an application profile which is based on Dublin Core. First of all, the Europeana Metadata Schema and the appropriate europeana elements must be present in your dspace repository. The following procedure has been performed in CentOS Linux 5.4 and Debian Linux 5. Prerequisites: Linux, Sun Java JDK, Apache Maven 2, Apache Ant, DSpace version 1.5 or newer. Warning! This plugin does not function in older versions of DSpace. Compile java-oai.jar with ESE support. Configure the current dspace installation in order to enable ESE support in the new java-oai.jar. The file java-oai.jar is part of the dspace package. It is not required to compile the whole dspace package but only the module which is responsible for the OAI interface. Download from: http://sourceforge.net/projects/dspace/files/ the file dspace-1.5.2-src-release.tar.bzip2 and untar it to a local folder. Using the linux shell, go to the folder: dspace-1.5.2-src-release/dspace-oai/dspace-oai-api and run mvn package. If everything works OK, the system will compile the software and after a lot of messages, the text BUILD SUCCESSFULwill appear on the console. If an error occures, some of the prerequisite files such as Sun Java JDK and Apache Maven are not installed correctly. Given that all the previous steps have been performed according to the plan, the file dspace-1.5.2-src-release/dspace-oai/dspace-oai-api/target/dspace-oai-api-1.5.2.jar must have been created. First of all, we backup the current dspace installation. Copy the newly created dspace-oai-api-1.5.2.jar from our compilation and replace file /dspace/webapps/oai/WEB-INF/lib/dspace-oai-api-1.5.2.jar in the current dspace installation. The created ESE metadata have been verified successfully using the Europeana Content Checker Tool. Η Ψηφίδα έχει υλοποιηθεί χρησιμοποιώντας το ανοικτό λογισμικό DSpace. 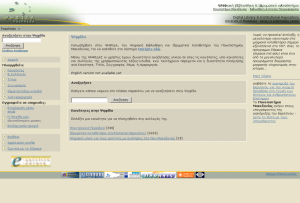 Βασίζεται σε τεχνολογία Java Server Pages (JSP) ενώ για την αποθήκευση των δεδομένων χρησιμοποιείται η Postgresql.